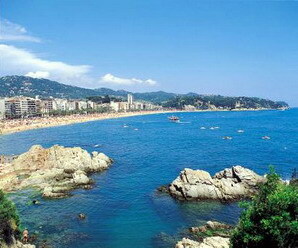 Lloret de Mar - Lloret de Mar is situated in the southern part of the Costa Brava, 70 Km away from Barcelona. This former fishermans village covers 48 square kilometres, and has five main beaches along a 7 Km of coastline. Its beaches have been awarded the blue flag by the EEC, bearing witness to the perfect state of beaches in terms of quality of the water, sand and services provided. 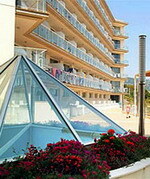 Aqua Hotel Bertran is housed in two blocks, 350 metres from Lloret de Mar's beach. The Water World Theme Park is three kilometres from the hotel, and the Botanical Garden is 4.5 kilometres away. 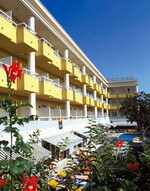 The hotel has an outdoor swimming pool with a sun terrace and loungers, and there is a kids' club during the summer. There is also a lounge bar, evening entertainment includes regular live music, and the air-conditioned public areas offer complimentary Internet connections. Parking is available in the hotel garage. Restaurant Bertran serves European buffet-style food in a contemporary setting. The 163 guestrooms, over seven floors, have light, pastel decor, contemporary furnishings and balconies. All are equipped with satellite television, air conditioning, hair dryers and safes. Cribs are available on request. 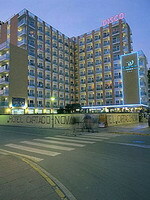 Located in Lloret center but also at just walking distance to the beach. Modern and large well decorated rooms all with balconies. Nice and modern restaurant with buffet bar. Modern hotel with many facilities as follows: Air conditioning, Heating, Garden, Entertainment program, Indoor swimming pool, Children swimming pool, Outdoor Swimming pool, Jacuzzi, Adapted for disabled, Restaurant, Cafeteria, Games for children, Children playground, Gymnasium, Sauna, UVA, Games room, Currency exchange, Safe, Rent a car, Satellite TV, Video lounge, Bar, Lifts, Garage, Panoramic lift, Varied saloons Room Services, Balcony, Air conditioning, Heating, Bathroom, Safe, Satellite TV, Telephone, Hair-dryer, Room service Dining Room Services, Air conditioning, Heating, Buffet breakfast, Buffet lunch, Buffet dinner. Hotel Excelsior is located in the Spanish seaside resort town of Lloret de Mar which lies 40 kilometres from the city of Girona and 80 kilometres from Barcelona. This six-storey hotel is built in contemporary style and overlooks the palm tree-lined beach promenade. The hotel has a health club set on its top floor with picture windows giving excellent sea views. Facilities include fitness equipment, a sauna, a steam room and a spa tub. The hotel has a 24-hour front desk and the air-conditioned public areas have wireless Internet access. The hotel offers a la carte and continental breakfasts in the cafeteria from 8 a.m. to 12 p.m. Parasailing, windsurfing and scuba diving are all available nearby. The 45 guestrooms have light decor, modern furnishings and balconies. Augusta Club Hotel is situated 100 metres from the resort centre and 250 metres from the beach. Girona Costa Brava Airport (GRO) is 40 kilometres away, and takes around 40 minutes to reach by car. Augusta Club Hotel has an outdoor pool surrounded by sun loungers and a poolside bar, and guests can make use of the onsite gym and solarium. 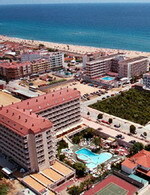 The hotel runs a programme of live music entertainment, including flamenco and karaoke. There is also a 24-hour front desk, a café-style lounge with Internet connections, laundry facilities, and garage parking for guests arriving by car (surcharge). Augusta Club Hotel's restaurant serves a buffet with a choice of local and international dishes. The 172 air-conditioned guestrooms, over four floors, extend to balconies and include complimentary Internet connections, televisions, telephones and safes. 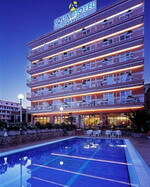 The Hotel Costa Encantada is located in Fenals, within one kilometre of the seaside town Lloret de Mar in Spain. The beach is 800 metres away and Barcelona is 77 kilometres from the hotel. 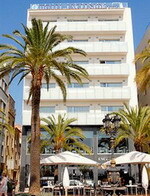 The Hotel Costa Encantada is a modern Mediterranean property spread over five storeys accessible by elevator. Guests can workout in the fitness room, go for a cooling dip in the indoor and outdoor pools and relax in the sauna. Guests at Hotel Costa Encantada can start the day with a complimentary buffet breakfast and enjoy an extensive international buffet in the hotel's modern restaurant. The hotel houses a poolside snack bar and guests can round off the evening with a drink and a dance in the onsite pub that houses a disco. The 285 air-conditioned apartments extend to living areas and kitchenettes equipped with refrigerators, cookers and tea and coffee making facilities. 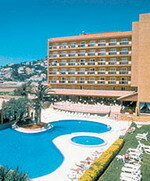 Hotel Roger de Flor Palace is located in Lloret de Mar, Spain. 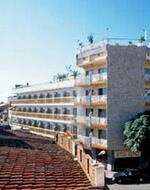 It is in a residential area, 200 metres from Platja de Lloret beach. This traditional hotel features tennis courts and an outdoor seawater pool. Fitness equipment is available. Guests can order from room service or access the Internet in public areas. Parking is complimentary. Hotel Roger de Flor Palace's restaurant has sea views and serves local and international dishes. Drinks can be enjoyed at the poolside bar. The 93 guestrooms open onto balconies and have leather armchairs. All feature cable television, safes, and direct-dial phones. Malgrat de Mar - a pretty coastal town, Malgrat de Mar is located in the southern part of the Costa del Maresme, bordering with the forest, in a level territory with some hills and extensive pine groves reaching to the sea. The Aqua Hotel Bella Playa is a modern resort hotel set 250 metres from the beach, resort centre and main promenade of Malgrat de Mar on the Costa Brava. Facilities at this family-friendly hotel include an outdoor pool surrounded by palm trees and terraces with sun beds, and a separate pool for kids, as well as a kids' club. There is also an indoor pool, a sauna, a television room with satellite and a reading room. Entertainment is also offered with shows, Flamenco, live music and discos. 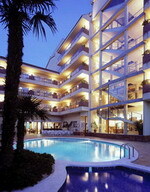 The hotel has a large buffet-style restaurant serving international and Spanish Dishes. Vegetarian and children's menus are available. Aqua Hotel Bella Playa offers 270 air-conditioned guestrooms located on eight floors, which have simple decor in warm Mediterranean tones with modern pine furnishings and tiled floors. All include balconies, cable television, complimentary internet connections, safes, hair dryers, telephones and refrigerators. The Hotel Cartagonova Management welcomes you from a special conception in understanding the new hotel keeping. In this we reflect commitment to service and a very specific offer: A comfortable hotel and an urban spa. Exclusive and in keeping with the most up-to-date demand. You will find a complete team of highly qualified and motivated professionals in the lobby. They will take care of your needs during your stay. If you so prefer, you can read the papers or have your favourite drink in our Bar, in an exceedingly comfortable atmosphere. Guests can relax on loungers around the pool, try their hand at water polo, work out with an aerobics class, and enjoy the live evening music. The restaurant offers an extensive buffet of regional and international cuisine and the hotel hosts a range of live shows and entertainment four nights a week in low season and five nights a week in high season. Guests can enjoy cocktails and a game of billiards in the bar before heading down to the Tropicana Nightclub, located directly under the hotel. The Hotel Luna Club is a modern complex set in gardens 200 metres from the beach, between the towns of Malgrat de Mar and Santa Susanna on the Spanish Costa Brava. The lagoon-style outdoor pool has sunbathing terraces, a separate area for children, and is flanked by sub-tropical gardens, while spa facilities include a range of massage treatments (surcharge), as well as a hot tub, solarium and a heated indoor pool. There is a children's room with games including table tennis and billiards, and an activity programme for kids and adults runs from June to September. There is a gym on site, and free Yoga, Tai-Chi and Shiatsu courses, and dance and aqua aerobics classes at the resort during July and August. The hotel's two bars provide relaxing locations where guests can enjoy snacks and cocktails, and the restaurant offers buffet local and international dishes, including vegetarian and children's options, in an informal setting. Pineda de Mar - a quiet Catalan coastal village that is out of the main tourist circuits. The village is famous for having the longest beach of the region. There are plenty of squares in the village where you can enjoy a drink in the shade. The Hotel Promenade is a modern, seven-storey property situated on the beach in the small resort of Pineda de Mar, 50 kilometres from Medes Island and 54 kilometres from Barcelona city centre. The Promenade restaurant offers an extensive buffet for breakfast, lunch and dinner, served in light, modern surroundings. Guests can work up a sweat at the gym or take it easy in the sauna, hot tub and swimming pool. Children can join in the fun at the kids' club and play in their own pool. Drinks are served at the Terrace Bar, and the hotel offers a full entertainment programme, with live shows and dancing several times a week. Guests can lounge on the beach opposite the hotel, enjoy traditional Spanish shows at the medieval castle, ten kilometres away, or visit Montserrat, 50 kilometres from the hotel. The Hotel Merce is a modern family-run hotel situated 400 metres from the beach in the quiet village of Peneda de Mar, 50 kilometres from Barcelona. Guests can bask on the terraces, enjoy a refreshing swim or play a game of tennis. Restaurant Merce offers a buffet of regional and international food in a light modern dining room. Alternatively, the pool-side bar serves grilled snacks, salads and pizzas. The hotel offers evening entertainment three nights per week during the summer months, including flamenco shows and live jazz music. Sightseeing excursions are organised by the hotel. Alternatively, guests can enjoy the beach and promenade 400 metres away, visit the Natural Park of Montnegre two kilometres away, or enjoy a fun day out at Marineland six kilometres away. Lloret de Mar is one of the liveliest resorts on the Costa Brava, with numerous clubs, bars, and discos staying open from dusk until dawn. The town boasts a variety of pretty beaches and a host of leisure facilities. It is also convenient for touring local towns and cities such as Barcelona, Figueres and Girona. Lloret de Mar dates back to the 3rd century BC, but it was during the late 1950's when tourism began to take off here and the resort became known as a popular package holiday destination. The main beach in the town is the mile-long Playa de Lloret, overlooked by a seafront promenade lined with shops, bars and restaurants. A variety of leisure activities are available at this beach, including parasailing, windsurfing, jet skiing and water skiing. To the south of the town centre is the shorter Playa de Fenals which sits alongside green pine trees. There are several pretty coves along Lloret de Mar's four miles of coastline, in particular Playa Santa Christina which boasts a lovely sandy beach. On a hill between the beaches of Fenals and Lloret de Mar sits the Castell de San Joan, which dates back to the 11th century. The castle has been attacked several times during its long history, most recently in 1805 when it was fired upon by a British warship. In the last few years Castell de San Joan has been restored and converted into a heritage centre. The cliff top gardens of Santa Clotilde are worth visiting for the stunning views of the coast. Designed by the architect Nicolau Rubio and laid out in the early 1900's, these Renaissance-style terraced gardens are perfect for some peace and quiet away from the busy resort. The scenery around Lloret de Mar is quite beautiful and there are a number of hiking and walking trails in the area. A map is available from the local tourist office. Lloret de Mar's biggest cultural attraction is the Maritime Museum near the seafront. It is housed within the historic former residence of the wealthy Garriga family, who made their fortune in Cuba during the 19th century. A few miles outside the resort is the popular family attraction of Water World. This huge water park has something for everyone, from hair-raising water slides such as the Kamikaze to small paddling pools for young children. The park also has a picnic area, mini-golf course and several restaurants. There is a free shuttle bus to Water World from the town. Also nearby is the golf course of Santa Cristina de Aro. Although Lloret de Mar may feel busy during the day, it's at night time that it really comes to life. There are scores of discos, bars and nightclubs to choose from, including the Caribbean-style 'Bumpers' club which has a glass dance floor, and the popular karaoke bar, Moby's. Lloret has a wide variety of restaurants, probably more so than any other resort on the Costa Brava. This choice includes fast-food outlets, British and Irish bars serving pub food and traditional Spanish fish restaurants. There are also international restaurants serving Indian, Chinese and Italian cuisine.